NETWORK FINALS: After adjustment for NFL preemptions, THE GREAT CHRISTMAS LIGHT FIGHT and THE GOOD DOCTOR both dropped 0.2, to 0.9/1.0. CABLE HIGHLIGHTS: ESPN’s MONDAY NIGHT FOOTBALL was down a huge 2.45 from last week’s big game, although at 3.08 it still dominated Monday cable. On VH1, LOVE & HIP-HOP gained 0.03 to 0.94, and TI & TINY was up 0.02 to 0.53. USA’s WWE telecast was at 0.85/0.80/0.73, compared to last week’s 0.94/0.87/0.81. On MTV, TEEN MOM was at 0.58/0.30, compared to last week’s 0.45/0.24. On Food Network, HOLIDAY BAKING CHAMPIONSHIP dropped 0.05 to 0.39, and CHRISTMAS COOKIE CHALLENGE was down 0.04 to 0.31. Adult Swim’s TENDER TOUCHES was at 0.36/0.32. On Discovery, STREET OUTLAWS rose 0.07 to 0.35. 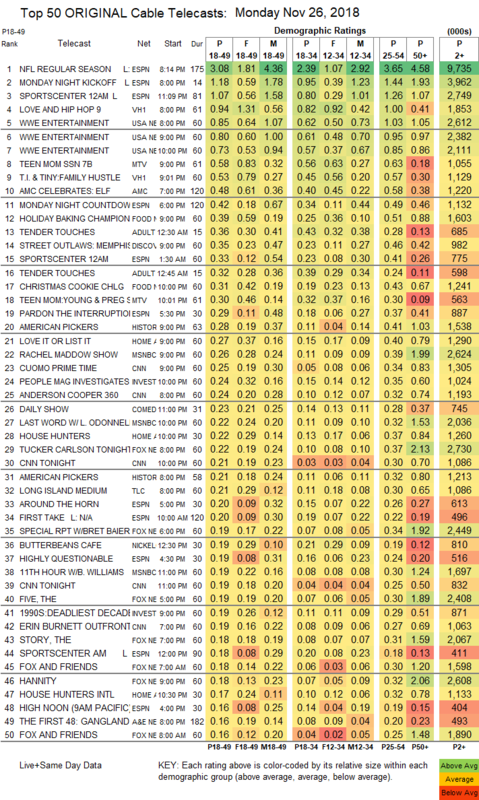 History’s AMERICAN PICKERS was at 0.28/0.21, compared to last week’s 0.16. On HGTV, LOVE IT OR LIST IT ticked down to 0.27, HOUSE HUNTERS was steady at 0.22, and HOUSE HUNTERS INTL was up 0.02 to 0.19. MSNBC’s RACHEL MADDOW SHOW led cable news at 0.26/0.39/2.6M, with CNN’s CUOMO PRIME TIME at 0.25/0.34/1.3M, and Fox News’s TUCKER CARLSON TONIGHT at 0.22/0.37/2.2M. On ID, PEOPLE MAGAZINE INVESTIGATES gained 0.02 to 0.24, and DEADLIEST DECADE held at 0.19. 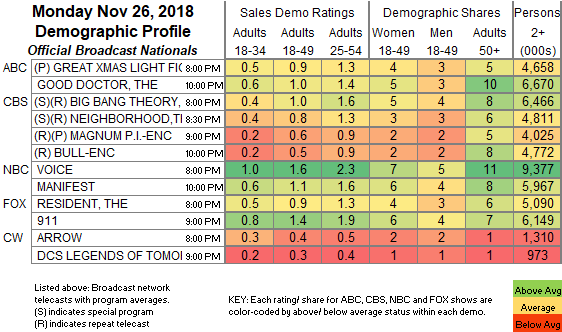 On TLC, LONG ISLAND MEDIUM ticked up to 0.21, LONG LOST FAMILY rose 0.04 to 0.15, and MAMA MEDIUM was down 0.02 to 0.13. Bravo’s VANDERPUMP RULES was at 0.16. HBO’s MY BRILLIANT FRIEND was at 0.02/151K.